As indicated in our last post, and as confirmed by the photo above, our apple kick definitely isn't over. Hell, we're even contemplating going back to Franklin for Round 2. Anyway, today we had a conversation with Adam about why we got in this food blog racket in the first place. We're just about to hit our first anniversary, so this is something we've been giving some thought to over the last little while, and something I'm sure we'll be writing about when we hit that milestone. What I can tell you at present, though, is that there've been a number of surprises (pleasant ones) that have fallen into our laps over the last 12 months because of "...an endless banquet," and our friend Adam's visit today was representative of just how pleasant these surprises can be. We knew Adam was heading down to New York and possibly even New Hampshire to do some research on a book he's been working on on the topic of fruit, and we knew he was planning on hitting a couple of very interesting sounding apple orchards. We'd even put in a request for a few prime specimens, but we had no idea if he'd actually be able to come back with anything, and what he'd be able to come back with if he managed to bring anything back. Needless to say, we were pretty excited when we got a phone call from Adam announcing that he'd come back to Montreal with treats for us, excited to see just what he had in store for us. You see, Adam had an appointment to visit the U.S. germplasm repository for apples in Geneva, NY. This wasn't just any old orchard, it wasn't even a first-rate orchard like Red Jacket (also in Geneva), this was a "living museum" of the apple, an apple "library," a collection of apple trees that numbered 5,000 and that encompassed some 2,500 varieties. 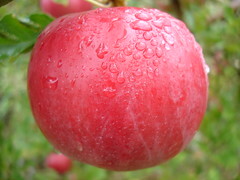 The germplasm depository had been created in the mid-19th century as a kind of Noachian attempt to preserve and document the 1,800-odd varieties of apple available in the U.S. at the time, as well as to ensure the future development of apple varieties. It's an endeavor that appears to have succeeded. Adam biked over this afternoon, we sat down at our kitchen table, and he told us about his tour of the repository and everything he'd seen. 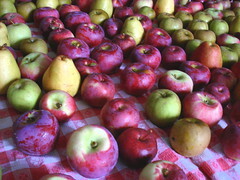 Then he gave us the assortment of apples, mostly heirlooms, that he'd brought back for us: two court-pendus, a rare French variety, a russett-golden delicious hybrid, a Cox's orange pippin, a Monroe, a big, firm variety developed in the more recent past, a jonah gold, and--get this--an Esopus Spitzenberg, another rare variety native to the U.S. that dates back to at least the early 19th century. As I'm sure you've been able to tell over the last few weeks, dear readers, we love our apples. Few things make us happier than an assortment of rare apples, especially when they're as beautiful as these ones. We've been warned that most of them might not necessarily be the best eating apples, but there's also a magic to just coming across strange types of apple you never would have imagined existed (like the court-pendus). Similarly, a week ago we got a completely unexpected visit from our friend Patrice Fortier, the gardener/farmer who runs the wondrous La Société des Plantes in Kamouraska. We knew he was in town, because he'd emailed me to let me know he was going to be around and that he was going to try to stage one of his informal vegetable & herb street sales, but then we didn't hear back from him. The last thing we were expecting was that he would show up at our doorstep, bearing freshly dug up heirloom fingerling potatoes no less. It was a Friday evening and I was just getting home from work. We sat in the dining room, had a beer and some Haldiram's All In One, caught up, talked about life at La Société des Plantes, picked out our potatoes, traded some pear-vanilla-bourbon butter for some of Patrice's delicious persillade, a pesto made with parsley, garlic, and sunflower seeds, and generally got the weekend started right. After a couple of hours, Patrice headed out the door to meet up with another friend, and we rolled up our sleeves and prepared our dinner. We turned up the music and found ourselves in the best mood. 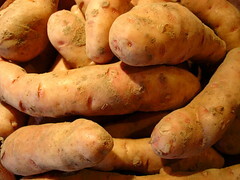 It's hard enough to get fingerling potatoes in Montreal (although there are signs that that situation is improving). Getting them delivered to your door and turning their delivery into an excuse for an impromptu Happy Hour is beyond ideal. Patrice is due back in town in the next week or so, and he's promised to come laden with white carrots, white beets, Brussels sprouts, potatoes, herbs, and other specialties. If he organizes a street sale, we'll be sure to let you know. Like I said, these little surprises aren't the reason we started "...an endless banquet," but they're certainly one of the reasons we've enjoyed working on "...an endless banquet" over the last year and are looking forward to year 2. Alongside soups and stews, gratins are a must for fall and winter. The rain has yet to turn to snow, but there's already a bit of chill in the air, prompting us to raid our cookbooks for seasonal recipes to warm up the kitchen with. For some reason, gratins were a mystery to me when I was younger. I remember trying to make one by pouring milk over sliced potatoes and baking it for what seemed like an eternity. The potatoes weren't cut thin enough, or weren't parboiled, or something, and what resulted was a disaster. Crunchy milk-soaked potatoes was simply not what I was hoping for. It wasn't even worth eating. And let's not talk about my vegan years, with Vitasoy and, uh, nutritional yeast. Never could understand why somebody didn't at least try to devise a more appetizing name for that stuff. 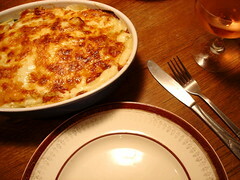 As with most soups and stews, gratins are not a quick meal to be whipped up and set down on the table after 10 minutes. The crust needs to be properly golden and well-formed, the flavours underneath need to melt together, creating a cohesive whole. Every bite should flow into the next, with no jarring textures or flavours. 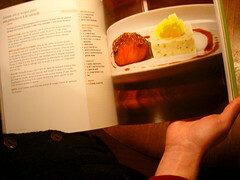 We used David Tanis's recipe from the latest Saveur magazine (no. 88). It was phenomenal. His instructions for Béchamel sauce were the best we've ever come across, clear and precise. We made it exactly as he recommended, with lots of nutmeg (freshly grated), and it turned out perfectly, the most delicious Béchamel ever. We were also mightily impressed by the effects of blanching the chard stalks. When all was said and done, the leaves and the stalks were each so distinctive that it tasted as though we had two vegetables mingling with the cheese and sauce, not one. Try it with Swiss chard, like we did, or experiment with fennel, kale, rapini, Belgian endive, or Brussels sprouts. I have a feeling nearly any winter green would work well with this recipe. Wash the chard and separate the stalks from the leaves. Slice the stalks into 1/4" by 3" pieces. Parboil in salted water with a bay leaf for 5 minutes, drain and set aside. Slice the greens into thin ribbons. Wilt the greens in olive oil and garlic, working in batches if necessary. Add salt, pepper, and red pepper flakes to taste. Set aside. 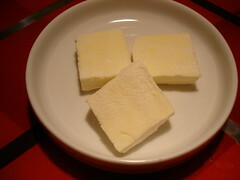 In a saucepan, stir the flour into the melted butter and place over medium heat. Stir constantly for 3 minutes. Increase the heat to medium-high and whisk in the milk, a few tablespoons at a time. When it has turned into a smooth paste, add the salt, pepper and nutmeg to taste. Cook, whisking constantly, until it has the consistency of a thick milk shake. Strain into a bowl. Butter a baking dish and spread the greens over the bottom. Add the stalks, then the sauce. Add a bit more nutmeg, then the parmagiano-reggiano. Add a few pats of butter on top of the cheese and bake for 25 minutes, until a nice golden crust has formed. Serve the gratin hot with wine and a nice salad. You won't believe just how good this dish is. Throw in some fish (trout, say) and rice, like we did, and you'll be in heaven. The second chutney recipe that I tried from Patricia Brown's Anglo-Indian Food and Customs was quite a bit spicier and quite a bit more exotic than the tomato chutney: fittingly, it's called Devil Chutney. Being a huge fan of hot and spicy cuisine, I found the name impossible to resist, but I also wanted to try out a tamarind-based recipe because I had a package of tamarind pulp that I'd bought at La Dépense a few weeks earlier that was just begging to be used. Brown's Devil Chutney recipe was the perfect excuse to transform that tamarind pulp into tamarind purée and put it into action. To make tamarind purée out of a block of tamarind pulp you need to break the block of tamarind pulp (around here they usually come in bricks weighing 250 g, which is exactly what you need for this formula) into little pieces as best you can, then pour 2 cups of hot water overtop, cover it, and let it sit overnight. The next day, you just pass the softened tamarind pulp and the liquid in the saucepan through a sieve, smashing the pulp against the wire of the sieve with a wooden spoon in order to extract as much tamarind goodness from the pulp. Make sure you scrape as much of the tamarind purée from the underside of the sieve as possible. Then place the tamarind purée in a jar and refrigerate it. You've now got the basic ingredient for a whole host of Thai, Indian, West Indian, and Central American dishes. Now, once you've got your tamarind purée prepared, place all ingredients in a blender with enough vinegar to make a smooth paste. Remove from blender and adjust the seasoning to taste. 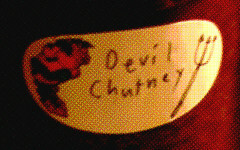 Your Devil Chutney should be hot with a sweet and tasty finish. Place in jar and refrigerate. It will keep for 3 weeks in the refrigerator. Yield: one 250 ml jar. Now, I wanted to can my batch, so I made a change or two to the recipe. Among other things, I sauteed some onion--I'd noticed that other recipes for Devil Chutney and "Hellfire Sauce" were often onion-based--then poured the puréed ingredients into my saucepan, added an additional secret ingredient, and then cooked it until it made a soft jam. That said, the basic recipe produces an excellent chutney, one unlike anything that's commercially available. It goes great with curries, but it's also excellent with cheese and crackers, and it makes for a truly wicked sandwich (I should know, because I've been having them for lunch all week). Well, I first got into making savory preserves (well, sweet and savory preserves) about a year ago when I returned from a trip to France and started making my own oignons confits. By the New Year, I'd found the ideal recipe, gotten the feel for how to get the mixture to gel perfectly, and come up with my own signature version of the recipe. It took me a while to branch out further, but over the last few months I've become interested in developing other preserves, and this week I've been working on my chutneys. I was inspired by a piece in the most recent issue of Saveur on the Semler family of Maine and their annual plum chutney-making ritual (and by the fact that our friend Camilla promptly made the Semler family's recipe with some of the beautiful Italian plums that you can find at the market these days, and was kind enough to bring us one of her jars). It hasn't been the best year for apples in this region, as we reported earlier last week, but it's been a phenomenal year for tomatoes. The tomato season started early this year, and it's lasted about at least 2-3 weeks longer than I've ever experienced in Montreal. This means that if you haven't had a chance to take advantage of this year's tomatoes, you still have time. We were just at the Jean-Talon market the other day, and the tomatoes aren't nearly as perfect as they were a month ago, but they're still pretty nice and they're very cheap. 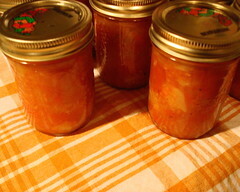 You could still make some tomato sauce or some ketchup aux fruits (as I intend to do later this week). You could also make some tomato chutney. Heat oil in a saucepan over medium heat. Add the mustard seeds and when they sputter lower the heat and add the next 6 ingredients. Simmer the mixture until it has the consistency of a soft jam (this should take about 20-30 minutes). Taste and adjust the seasoning. If you're going to can the chutney, keep it warm right up until the point that you pour the chutney into your sterilized jars. Otherwise, allow the chutney to cool before bottling it. If you choose not to can the chutney, it will keep for about 3 weeks in the refrigerator. Yield: 750 ml--I canned my batch in 3 x 250 ml jars and there was just enough left over to give Michelle a sample of the goods. 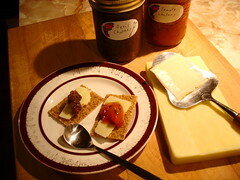 This tomato chutney turned out fantastic, excellent with curries of all kinds--Indian, Anglo-Indian, and otherwise--and delicious with a nice sharp cheddar, as in the photo above. The tomato chutney is the one on the right. Remember those pears we bought earlier in the week? Well, they were amazing: firm on the outside, with beautiful coloration, and, as Michelle put it, fondant on the inside, with not a trace of mealiness. In truth, we're not exactly sure what kind of pears they are, but if the illustrations in Alan Davidson's Fruit: A Connoisseur's Guide and Cookbook can be trusted (and I think they can), then they appear to be Williams pears. Too bad we don't have that distilling operation up and running, because they'd be probably be ideal for schnapps. 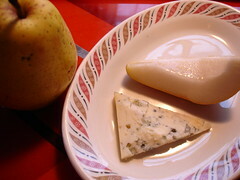 What I am sure of, though, is that those pears were ideal with cheese. There was no question that they would be, so we organized a tiny, little pear & cheese soirée last night. We knew the cheeses had to live up to our pears, so we ran up to Yannick on Bernard and found exactly what we were looking for: a lait cru Vacherin, a wonderful little Comté, and, most importantly, because this was the cheese we were convinced would go best with the pears, a slice of their somewhat decadent Valdeon. Yannick is definitely the best place to go for those runny cheeses that must be at the peak of ripeness--like your St. Marcellins, your St. Feliciens, and your Vacherins--and our Vacherin was just that: perfectly ripe, absolutely irresistible. Comté is one of the great cheeses to have with apples, and that's exactly the way we had it, with slices of our cortlands, empires, and russets. But, as I've indicated, the highlight of the night was that combination of pear with the creaminess and pungency of that Valdeon, which currently ranks #1 on Michelle's list of blue cheeses. To add to the decadence of the occasion, we ate our meal on that apple and pear-covered table we photographed for our last post. We'd cleared a little bit of room because, between my 3-4 apples-a-day apple habit and Michelle's preserve-making, we've been making the apples disappear slowly, but the table was still very much covered with our harvest as we ate [see "the haul, pt. 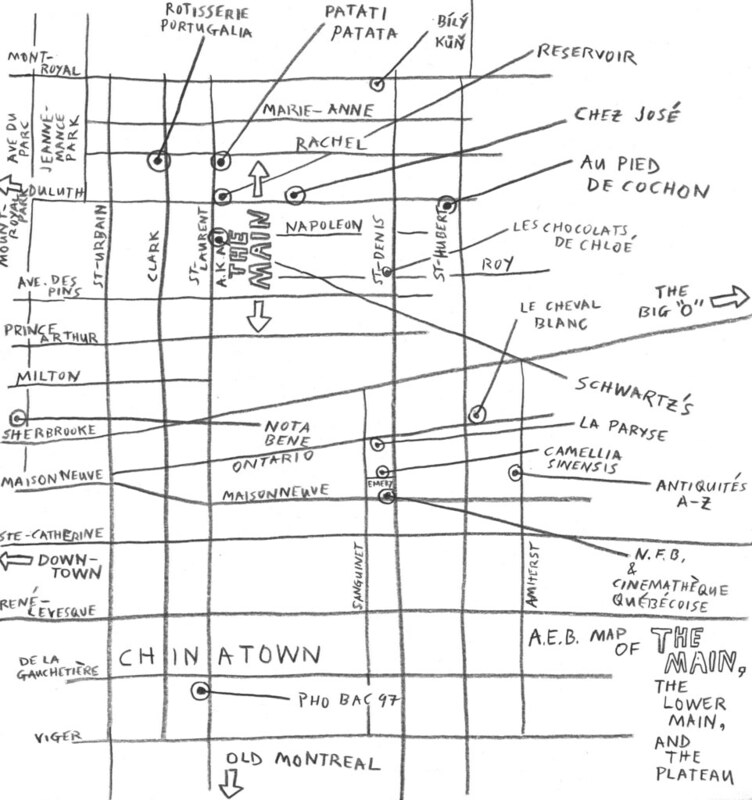 2" in our "In Search Of..." post to get a sense of what I'm talking about]. It called to mind an outtake from Peter Greenaway's Drowning By Numbers, but, as Michelle pointed out, we were missing a dead swan or two, and possibly a pheasant. In fact, it was a fairly simple meal--cheese, fruit, bread, wine, a turnip potage, and a salad--but the setting and that magical pear and Valdeon combination (you can see them together in the picture above) gave it a certain splendor. Pear season is a short one, take advantage of it while you can. Eating your very own pear and cheese meal off an apple-and-pear-covered table is purely optional. P.S. There's no reason to worry, or call the police, or anything, we've cleared off the dining room table since last night's dinner. In Search of... Covey Hill and "Unsurpassed Flavour"
This year, not only did we want to avoid those big, touristy apple orchard/amusement parks, but we actually wanted to go some place different, some area we'd never visited before to pick our crop of apples. We'd been excited to go apple picking ever since we'd paid a visit to Red Jacket in New York at the beginning of September--after all, Quebec is a premier apple growing region, too--but we really wanted to go some place new. That's why we went to Covey Hill. but it was only a couple of weeks ago, when I started to think about where I might like to go apple picking this time around, that I took a close look at it and thought to myself, "Hmm, Covey Hill..." You see, we'd been using the crate for storage, and we'd stupidly placed the side you see in the photo out of view. 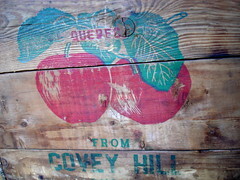 The sides that read "Unsurpassed Flavour" and "Saveur Insurpassable" had always been in view, but we'd only just turned the crate around so you could see the "Covey Hill" side. As quests go, this wasn't exactly a search for Rosebud, but it was something. Covey Hill doesn't appear on most maps these days, and the first two internet mapping services that I consulted didn't turn it up either. 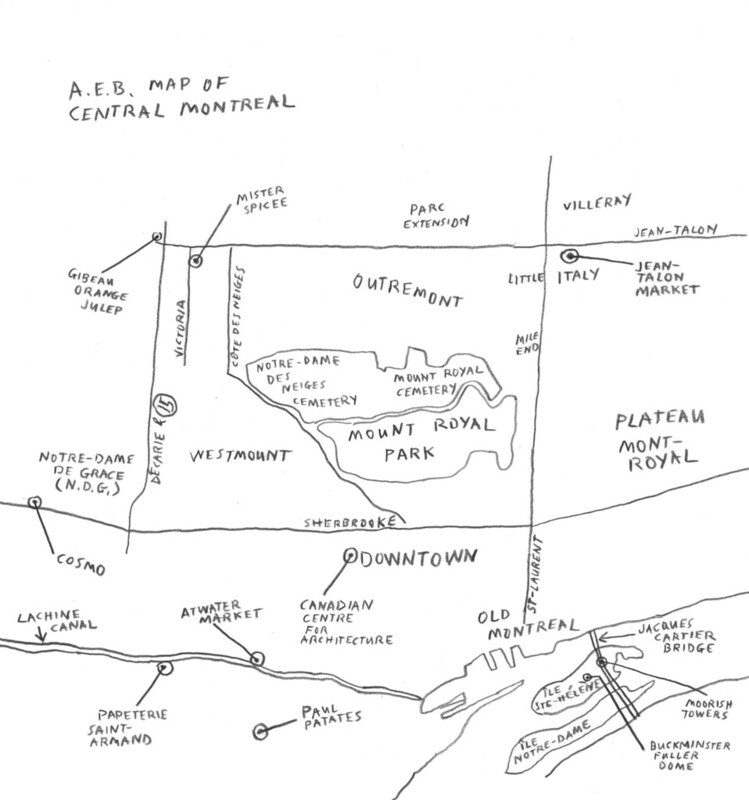 But I found other references to Covey Hill, and what I read--the fact that Covey Hill is the only part of the Adirondack chain that sits on Canadian territory, the fact that's its known for its unusual transitional ecosystem, etc.--got me further interested. 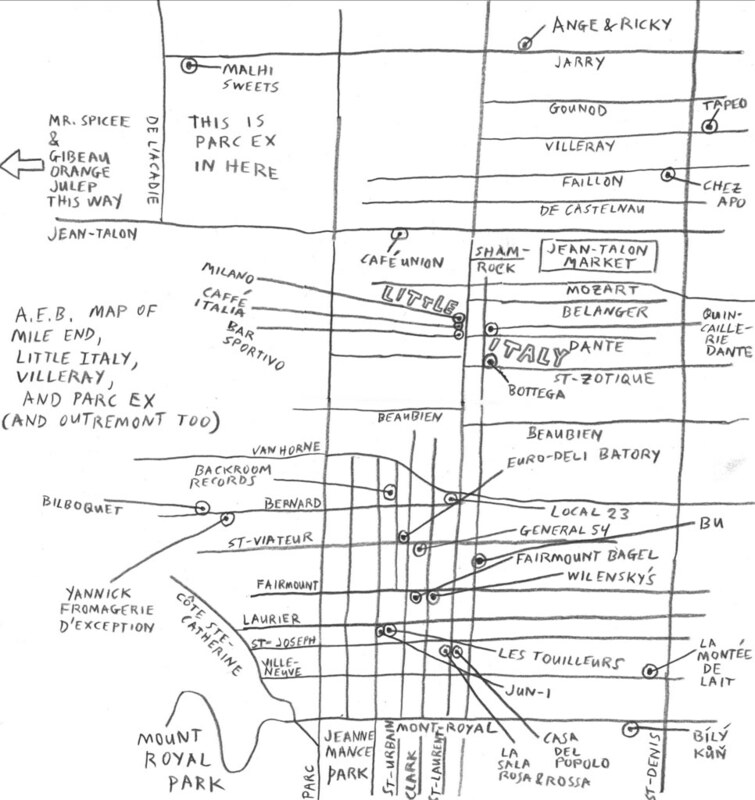 When I finally pinpointed its location--in the southwestern corner of Quebec, just above the New York border, west of Hemmingford along the 202 just before Franklin--and found out that the area was still heavily dotted with apple orchards, I was sold. So on Monday, we took advantage of Canadian Thanksgiving--a holiday which is awkwardly placed after a weekend and which is low on mythology and obligations (in other words, a holiday perfect for apple picking)--to make our way to the countryside. We zipped down the 15 towards the New York state line, then cut across the 219 to Hemmingford, a town that holds a place in Michelle's pantheon because of its celebrated yarn fair. We took a quick look around for any signs of a yarn fair or a Thanksgiving Day méchoui, then veered off on the 202 along a route that became more and more sparsely populated, and more and more scenic, as we headed west. Only the occasional farm, horse stable, and orchard broke up the landscape, which was getting more and more forested the further we went, and around Havelock we suddenly began to see a somewhat imposing, if low, hill that could only have been Covey Hill. a few spooky, mist-enshrouded farms, and some other landmarks. Then we turned our attention to neighboring Franklin, which is just a few kilometers further along the 202, and has at least a dozen apple orchards of all sizes. We toured the area to try to get a sense of what the different orchards were like and which ones we'd be interested in picking our apples from. For the most part, they all looked pretty amazing, their trees heavy with dark red fruit, and I was relieved to see even the biggest of the orchards in that area were not all that tourist-oriented. Sure, the larger ones--like Hillspring Farm, one of the region's bigger apple cider producers--had added attractions like pony rides and whatnot, but these weren't the kind of full-on three-ring circuses that you find in some parts of Quebec. For the most part, apple orchards, like cabanes à sucre, have gone so crass in recent years, you really have to dig a little to find places that don't turn your stomach. Anyway, we were mostly interested in finding selection, because we had some harder to find apples like russets in mind, and if we could find a smaller, quieter orchard and support a small farmer, all the better. We saw a couple of orchards that looked promising right in the heart of Franklin, but Michelle had spotted a couple of smaller orchards outside of Franklin centre, towards Havelock and Covey Hill, so after making a stop to pick up some wonderful honey crisps from one stand, we headed back towards Covey Hill. A few minutes later, we pulled into Eugene Safian's orchard, and as soon as we got out of the truck, took a look around, and talked to M. Safian we were sure we'd made the right choice. M. Safian had about 8 varieties ripe for the picking, including russets, spys, empires, cortlands, red delicious, and golden delicious, he had wonderful-looking pears for sale, his prices were right, and he was a real sweetheart of a guy. M. Safian took us out into his orchard and showed us where we could find what and which trees he recommended, then we sampled a couple of apples and got to work. Within a half an hour we'd filled our two big buckets with as wide a selection of apples as we could get our hands on. Then we went back to M. Safian's stand, talked him up about his selection of homemade preserves, honeys (including his hearty buckwheat honey, which he insisted was rich in vitamin C, and therefore the perfect antidote to the common cold), and pears, made some selections, and paid up. A good-sized bucket of pears came to $10.00. Our buckwheat honey came to $4.25, with the 25¢ rebate we got for being good customers. 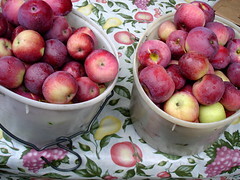 And those two big buckets of apples came to a mere $6.00 each, about $4.00 less that most of his competitors. 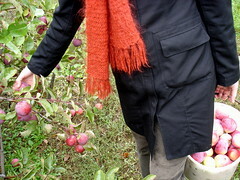 When we'd gone out into the orchard with him, we talked about how 2005 had proven to be a poor year for apples, with a late summer and early fall that had been too hot and too humid to make for a good apple crop. All I can say is that when we tried M. Safian's apples we sure couldn't tell it had been a bad year. His apples were as good as any apples I've ever had, crisp, juicy, and full of flavor. 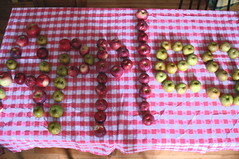 When we got home, we laid the apples out on our dining room table so that they could air dry (it had been raining in Franklin/Covey Hill). Then Michelle took a few gems from our haul, peeled them and diced them, and whipped up an apple crumble for our afternoon snack. 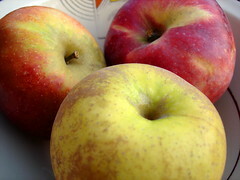 We sat down, had a cup of "autumn blend" tea, ate our crumble, and basked in the glow of our fresh-picked apples. 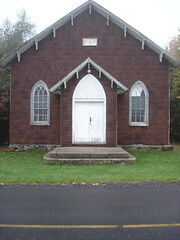 Covey Hill and Franklin are located on the 202, about 20 km west of Hemmingford, just north of the U.S. border. M. Eugene Safian's orchard is just east of Franklin, between Franklin and Havelock, on the north side of the 202 near the point where it intersects with the 201. As his handmade business card reads, he has apples, pears, and honey for sale and you can reach him at (450) 827-2423 after 9 p.m. Sorry, he doesn't have a website. Oh, and, by the way, M. Safian estimates that he should have apples available for about another 4 weeks. Yes, we're back on the topic of food in San Francisco and environs, this is most likely our penultimate California post, and, believe me, we may very well have saved the best for last. We carried out a few taste tests while we were out in California, but there's no question that the most comprehensive taste test, and the the most satisfying one, was our burrito taste test. Once we got going, it was hard to stop. Every day we wanted to sample another taqueria's goods, or at least return to a favorite taqueria. Part of the "problem" was that we were staying with my sister in Noe Valley, just a short hop from most of the finest taqueria's in San Francisco (if not the known universe). Sometimes we almost had to force ourselves to go elsewhere and try out other cuisines to round out our experience of the Bay Area's best eats, when all we really wanted was another burrito. We don't really have this "problem" here in Montreal. There's been a spurt in the number of quality Mexican eating establishments here over the last few years, but, as of yet, there are no taquerias here that can hold a candle to those of San Francisco. I'm reminded of a line from that short-lived Spenser For Hire spin-off that focused on Spenser's associate Hawk. If memory serves me well, the line went as follows: "Take the baddest dude you know, multiply him by 2, add a couple of zeroes to that, and that doesn't even come close to how bad Hawk is" [actually, on second thought, I'm sure that wasn't an example of memory serving me "well"]. The same could be said of the relationship between a Montreal burrito and a San Francisco burrito from a place like Casa Sanchez, let alone a place like La Taqueria. We knew we had a limited amount of time and we'd have to work fast, so we headed straight into the Mission District when we got to San Francisco and made Casa Sanchez our very first stop of the entire trip. From that point on, we tried to not let two or three days go by without having another burrito. Sometimes I wish I was more like Calvin Trillin, who claims to only be a serious eater, not a serious cook. Our desire to take advantage of the local shops and markets, with their excellent local ingredients, and to cook at home probably kept us away from quite a number of magical food discoveries--god knows what kind of Mexican and Mexican-American delights we might have chanced upon had we had more meals on the town!--but, then again, it also kept us from running out of money within 3-4 days of arrival (as opposed to 14). When our informal burrito taste test was done, we'd tried everything from breakfast burritos (like the one pictured above--with eggs, bacon, and sausage--that we had at the Alameda Flea Market), to baked burritos (in an American-Mexican [if you catch my drift] restaurant in San Juan Bautista, to vegetarian burritos (both standard bean-based burritos, as well as a grilled vegetable burrito), to chicken, pork, and beef burritos, and a whole range of tacos (in some cases, as "dessert") to boot. I've been going to Casa Sanchez to have their burritos for over 10 years now, I love the selection of salsas they offer from their salsa bar, and as long as they continue to maintain their high standards when it comes to their burritos and tacos I'll continue to be loyal, but the two biggest revelations of the trip, in terms of burritos and tacos, were found elsewhere. In both cases--one traditional, the other a bit more new-fangled--what distinguished our top choices from the competition had to do with the quality of the grilling, the freshness of the ingredients, and, perhaps most immediately, the tortilla itself. It's amazing what a difference just the tortilla alone can make, in terms of texture and in terms of overall flavor. As a former vegetarian I feel a little strange saying this, but, I have to admit, I was a bit skeptical of Papalote from the moment I laid eyes on their menuboard with its wide selection of vegetarian and vegan burritos. I remember thinking, "This place is awfully close to Noe Valley. 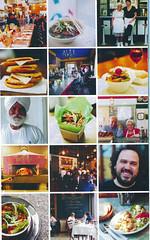 Maybe it's just the taqueria equivalent to that yuppie botanica around the corner from Karina's place on Church." Any doubts I might have had were erased within a matter of minutes when we received our three burritos--one grilled vegetable and black bean, one grilled prawn, and one carne asada. As vegetarian burritos go, the grilled vegetable and black bean was by far and away the best we encountered during our trip. 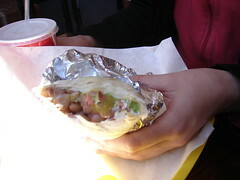 Understandably, vegetarian burritos in traditional taquerias can often be a little lackluster. Papalote's was anything but. 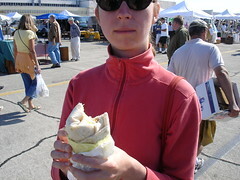 The true standouts, however, were the grilled prawn burrito and the carne asada burrito. I couldn't believe how generous the prawn burrito was, and the carne asada burrito was tender, juicy, and wonderfully seasoned. Excellent. If we had to pick our very favorite taqueria, though, it seems as though we'd be in agreement with the overwhelming majority of San Francisco's burrito aficionados: La Taqueria. We tried their vegetarian burrito (pictured below), their chicken burrito, and their carne asada and carnitas tacos over the course of a couple of visits. The vegetarian burrito wasn't nearly as inspired as the one we had at Papalote, but everything else was fantastic. We had a hard time deciding which meat--chicken, beef, or pork--we liked the best, they were all so delicious, and La Taqueria's burritos come "unadulterated," without any rice, so you really get your money's worth. Plus, the atmosphere at La Taqueria is just so classic. We became La Taqueria regulars in just two short weeks in San Francisco; there's no question that we would be regulars if we actually lived there. Sadly, Michelle and Camilla's classic cookies dessert du jour is now a thing of the past--such is the life of a dessert special--but the good news is that their tea-themed trio is back! Inspired by an article on Chantal Chagny's terrific-sounding Auberge du Cep in the most recent issue of Saveur, and by a description of Chagny's "house cocktail" in particular, we concocted our own Apéritif Beaujolais last night for a small gathering of friends. The original Auberge du Cep recipe consists of a bottle of beaujolais, some crème de cassis, and some sweet framboise liqueur, mixed together and then served from a pot (a rustic, yet elegant earthenware pitcher) that has been chilled for a minimum of six hours. We altered this formula just a little bit, making the finished product a little less boozy and a little more seasonal. 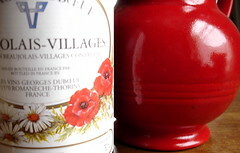 We took a bottle of beaujolais (a 2003 beaujolais-villages) and 3 oz. of crème de cassis and poured these into our favorite pitcher, our red Émile Henry. We then added 1/2 oz. of a cranberry syrup that Michelle made especially for this drink by stewing cranberries with water and sugar, placing the compote in cheesecloth, and then collecting its syrup in a bowl. We mixed the combination well, placed the pitcher in the refrigerator, and six hours later we were serving a wonderful little cocktail--crisp, light, and refreshing--alongside our cheese appetizer. Yesterday it was still unseasonably warm and humid for this region. Our chilled beaujolais apéro made for the perfect Indian Summer beverage. Today the temperature has dropped considerably, and there's a bit of chill in the air. If we'd held our soirée tonight I'm not sure I would have served a chilled drink as the apéro--I'm already beginning to lean towards gluhwein--but with that hint of cranberry, our variation on the Apéritif Beaujolais is an ideal way to start off a Canadian Thanksgiving celebration, or any other celebration you might be having this weekend. When she hasn't been busy preparing preserves over the last couple of weeks, Michelle's been busy in the pastry kitchen of Les Chèvres and Le Chou. You see, the pastry chef, Patrice, has been away on vacation and so Michelle and Camilla having been pulling extra duty while he's away. 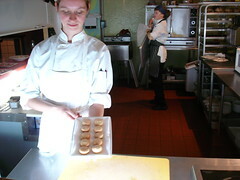 On the down side, they've been working every day over the last two weeks just to keep on top of things--in other words, they've been learning what it's like to be a real pastry chef--but, on the up side, they've gotten the privilege to dream up, design, and produce the dessert du jour for the last couple of weeks. You should have seen them. They were so excited to get the opportunity to unleash one or two of their visions on an unsuspecting public. 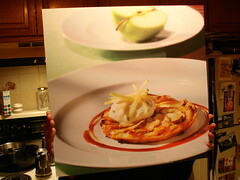 Their first dessert du jour was the beautiful dessert you see pictured above. It was organized around a tea theme--one perhaps inspired by IMBB's tea-themed meme from July--and it included three components. 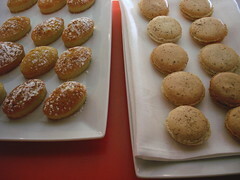 The first component was a trio of tea-scented miniature madeleines. 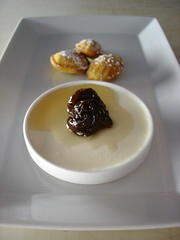 The second was a crème fraîche panna cotta drizzled with a tea-scented sirop. And the third was a garnish of plump prunes stewed in Oolong tea. It was a perfectly balanced dessert, light on the palate, full of flavor, subtle yet irresistible. The panna cotta was lovely, among the best I've ever had, and I thought the madeleines were a wonderful touch, but it was the assortment of stewed prunes that really made this dessert du jour a standout. Their second dessert du jour was a bit more whimsical. 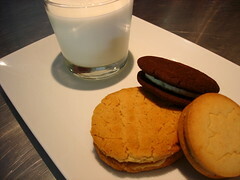 Camilla and Michelle took the classic combination of milk and cookies and ran with it. As you can see, the plate consisted of three jumbo, icing-filled layer cookies and a glass of milk. Cookie #1 was a peanut-butter cookie. Cookie #2 was a maple-flavored cookie. And cookie #3 was their take on the Oreo. I knew about the peanut-butter cookie and the Oreo going into my tasting, but the maple-flavored cookie was a last-minute addition, so it was a surprise, and a very nice one at that. I thought it made a perfect match with the other two, and it also gave the combo a nice Canadian twist. The Oreo was fantastic, suitably chocolatey and sweet, but made with a quality cookie and truly tasty icing. The peanut-butter cookie was a serious peanut-buter cookie, sure to be a hit with all those peanut butter die-hards out there (you know who you are). Finally, the complimentary glass of milk was a stroke of genius, rounding out the concept behind the dessert, but also providing you with just the right beverage to accompany this dessert du jour. My advice: do yourself a favor and forget about the Girl Guides! Sadly, the tea-themed dessert du jour is no longer available, but you can still get Camilla and Michelle's assortment of classic cookies through Sunday. The dessert du jour costs a mere $6. Well, we had what's know in the biz as a banner weekend. We sold out of preserves for the second day in a row yesterday. Our Saturday night + Sunday morning production frenzy produced another 20 jars of švestka preserves (oignons confits, peach-vanilla-rum butter, more pear-vanilla-bourbon, more of that beguiling preserve known only as l'Autrichienne, some Lady Grey-infused marmalade, and some Seville orange marmalade) and we brought in our ringer from our Eastern sales division, Ivan, just to make sure things went along smoothly. Ivan introduced us to a couple of his hard-nosed sales schemes and, lo and behold, the jars began to fly off the shelves again. There's no question that Ivan's no-nonsense "These jams are delicious!" billboard was a hit, but even more effective may have been his "jam kid" routine. It's amazing what kind of effect a 7-year-old with jam smeared on his face wandering around a trade fair saying "Mmmm, those jams were delicious" can have on sales. Thanks again to everyone who turned up to say hello, try our samples, give us much-appreciated feedback, and buy a jar or two (or three!). Thanks also to Viola Blanca, Geneviève, Stitch-Stitch, and all the other friends we made over the course of the weekend. If you're interested in getting your mitts on one of our jars of švestka preserves because you missed us at Puces Pop, or because you'd like another jar, or because you're just curious, feel free to contact us. We're getting back into production this week and we'll be stocked up again sometime soon. 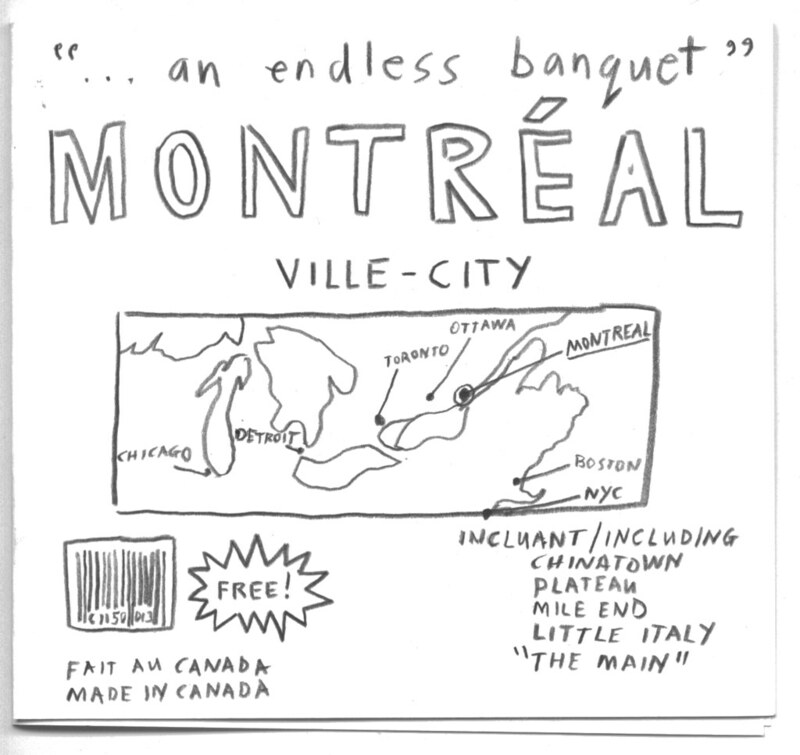 I'm not sure that we're ready to ship outside of Montreal yet, but if you live in Montreal arrangements could be made. Otherwise, I'm sure we'll be taking part in another show or two before year-end, and there's even talk of starting to supply a local boutique or two with preserves sometime in the near future. We'll keep you posted. 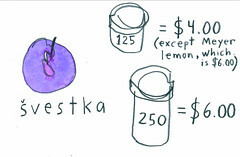 Oh, and, yes, švestka is Czech for plum. I mean that in the best sense possible. Michelle showed up at the Puces Pop festival this morning with close to 50 jars, and by 5:30 PM I sold the very last jar we had. We sold out completely and Puces Pop was still 1 1/2 hours from shutting its doors for the day (!). Needless to say, we were pleasantly surprised (not quite to the point of paraphrasing Sally Field's infamous, "You like me. You really like me," but close). And we had a great time, too. I'd never seen the Fusiliers Mont-Royal armory building hall look so appealing and so alive (I'd been there for a couple of record fairs in the past), there was a nice vibe to the day's events (including live music, DJs, and a full-on fashion show), and we met a lot of really nice people. Hats off to Sarah and everyone else who took part in the organization. Anyway, we're back in production so that we can show up tomorrow, give away some more free samples, and meet some more people. 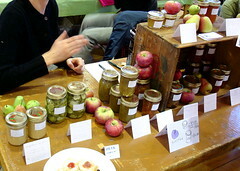 I'm not sure exactly what we'll have on offer from our "švestka" line of preserves, but if you're planning to come on out and pay us a visit you might find oignons confits, pear-vanilla-bourbon butter (definitely one of today's super-hits), and l'Autrichienne, which is an apple, walnut, and raisin preserve that was originally devised for the Archduchess Maria Theresa in order to console her after the humiliations of the War of the Austrian Succession, and that has been a closely guarded secret handed down from generation to generation within a very small Prague-based circle for some 200+ years, that we would now like to offer to you. Thanks again to everyone who came out to visit us today, and any of you who might be planning on stopping by Puces Pop tomorrow, we look forward to meeting you, too. 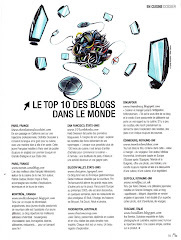 For more information on Puces Pop, check here.